Using pavers to create a new pool deck offers unbeatable customization for the cost. A pool deck can make or break your experience of the entire pool. Old pool decks with cracked or slippery concrete can not only look and feel unpleasant, but they can also cause slipping and tripping hazards. No one wants their fun summer afternoon to end in injury! L.R.E. Ground Services, Inc. specializes in concrete pavers that add beauty and value to your home. Our pavers allow you to customize your pool environment in a safe, reliable way. You'll be grateful for the comfort and style your new pool deck will offer! 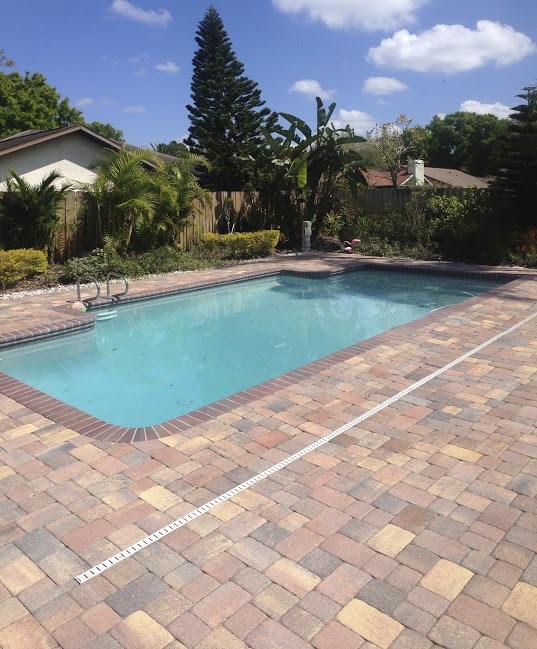 Contact us today for an estimate at no cost on pool deck pavers in Clearwater, Tampa, Saint Petersburg and the surrounding Central Florida area. When is it a good time to install a pool deck paver? If you're experiencing problems with your current pool deck, installing concrete brick pavers can be a great alternative to concrete repair or resurfacing. When a pool deck becomes cracked and uneven, a serious tripping hazard exists for children and adults. Beyond the risk of injury, leaving a damaged pool deck untreated allows surface water to enter the cracks, possibly causing further erosion and settlement. It's in your best interest to prevent this damage by creating a new pool deck with concrete pavers! Additionally, if you're looking to completely overhaul the appearance of your pool deck, pavers can be a cost-effective solution. Rather than installing expensive real stone around the side of your pool, you can get the same effect with pavers in colors and styles that you choose. The trick is picking complimentary colors and varying the sizes and pattern of the pavers. L.R.E. Ground Services, Inc. can also install brand new pool decks using pavers, so whether your pool has just been put in or if it's been around for years, there's still a way to dramatically alter its surrounding features! When you contact L.R.E. Ground Services, Inc. to install a pool deck, we'll perform a full inspection to determine the condition and needs of your property before we get started. Sometimes, there may be soil settlement issues to resolve, such as a small sinkhole, weak fill soils that have compacted, or clay soils that cause damage by expanding and contracting with changes in moisture content. Before beginning any work, we'll make sure that the soil beneath the pool deck will provide solid, stable support in the future. When you choose to work with L.R.E. Ground Services, Inc., you'll get a combination of creativity and craftsmanship that will result in a project you can be proud of. Our skilled employees will work with you to ensure every aspect of your paver pool deck is handled with precision and care. Contact us today to schedule a free estimate in Largo, Tampa, Clearwater, Saint Petersburg, New Port Richey, and nearby!